Hello Stan Winston School of Character Arts! I've got a bit of an announcement to make! About ten-minutes drive from where I live, there is an agriculture facility called Boone Hall. Every year on Halloween, the host a haunted house attraction. A few months ago, I showed them an animatronics idea for next year. In a few months, I will begin construction on it. It's a creation that I call The Earth Worm. Inspired by the gradoids from the 1990 sci-fi thriller "Tremors", this 10 foot long creature is controlled by four puppeteers. the main puppeteer controls the air-pressure muscles that drive the metal skeleton of the earth worm. It also has three more puppeteer, each controlling a 3-stage animatronic tentacle in the earth worm's mouth. I'll post some drawings when I get the Chance! That sounds like an awesome project! I'm a huge fan of the Tremors franchise. I actually went to the 25th anniversary cast and crew reunion screening this year, and it was amazing. So many wonderful stories and memories were shared. I can't wait to see your designs. Sounds Brilliant. I recently saw a very interesting video on a flexible robotic system using air muscles. Pnuematics is a wonderful medium to work with however.. the supply and control mechs are often very difficult. I'm starting on designing the structure of the creature's skeleton. However, before I actually build the final product I think I'm going to just do a garbage bag test with this thing. The term "garbage bag test" Refers to making a rough model of the creature out of common household materials like cardboard, garbage bags, and coat-hanger wire just to get an idea of the finished product relative to a human. This method has been used in a lot of places, and as Richard Landon said in his "Animatronics Design Basics" lesson, Stan Winston Studio used this technique when building the Alien queen. For cheap bladders there are condoms. I know of more than a few instance where they are useful in SpFx.. The original Howling move used them to expand the skin to make it look like muscles were growing under it. That is cool David! I've also seen condoms used as makeshift Squibs; the best way to do a gunshot wound on a budget, tie a piece of fishing-line to a washer, superglue that to a condom full of fake blood, and duct-tape that to their chest beneath their costume. The washer can be used to rip a hole in the condom like it's the pull-tab on a can of sardines. When the washer is pulled using the attached fishing line by someone off camera, the fake blood leaks out and it looks just like the actor just got shot in the chest! Now, Air-muscles are pretty much the most simplistic form of pneumatics to machine. All you need is a couple of pipe-fittings, some braided nylon cable sleeve, and some latex tubing. Also, an air-compressor. Ah.. Air Muscles are simple, and using nylon webbing you can direct the force of expansion. However unless you of in for a lot of sensory and electronic valve control it will never get to be controllable by a micro controller. Likewise using water works well if weight is not a factor since air is compressible and water is not. I've used water to inflate and then deflate a balloon just by using a 50ml syringe and some tubing. It's also pretty easy to make it a closed system and the number of extremely cheap peristaltic pumps on eBay makes the control and drive systems easier. But I am more a 'hands off' controller. I think that I've found an alternative to the air-muscles! The other day, I found these Pneumatic cylinders on Amazon for a pretty fair price too! I'm also working on a maquette sculpture as well! Sounds amazing! Can't wait to see your progress on it! Good luck! Pneumatics are a lot of fun to work with. I've always wanted to try hydraulics for a character, but that can get a bit expensive. @Chris Ellerby I know they can be! But they don't exactly make servos projects of this scale! My pneumatics are actuated by compressed air! Now, for the tentacle mechanisms, the first stage of the tentacle is going to have bigger discs than those of the second stage. as for the end stage. I'm going to have an open-close mechanism on the end, similar to that of the imp-tongue that Richard Landon showed in his lesson. 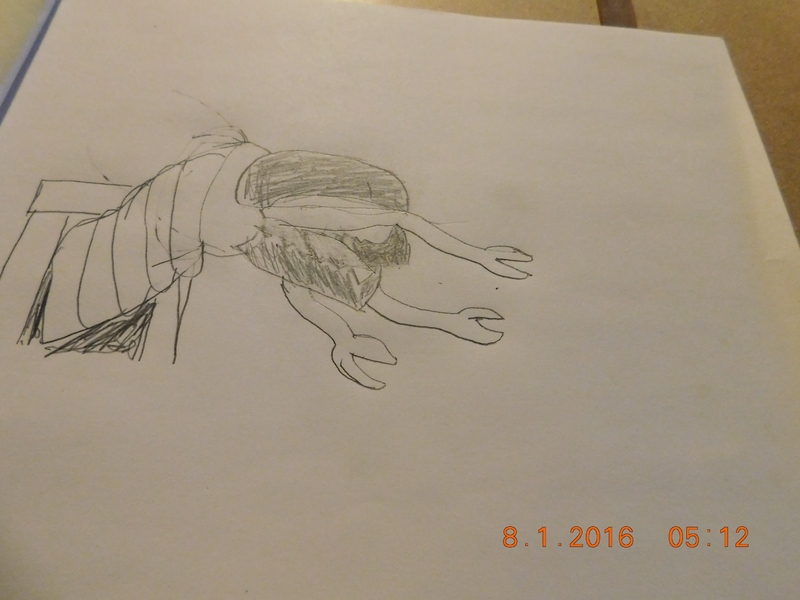 Well, Here's a drawing of the basic concept of the Earthworm. Awesome. I just watched Bert killing one in his basement yesterday. @Anthony Sterl Thank you! I've got it coming out of a mine shaft!